Eric W. Noll ’83, P’09 would have returned to campus for Alumni Weekend anyway. His devotion to Franklin & Marshall College spans decades and takes many forms: alumnus, parent, trustee. 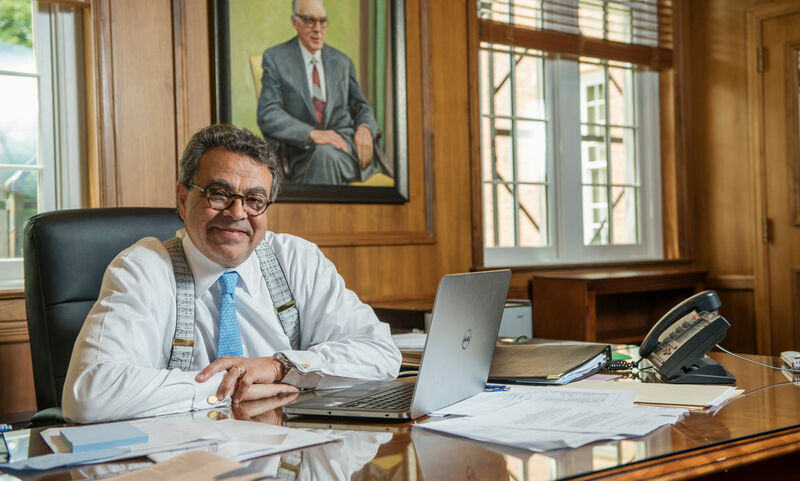 Now, in his 35th reunion year, he steps into a new role as interim president of the College, having steered a successful search for F&M’s 16th president, Barbara K. Altmann, who begins her official duties in August. When Noll comes to work, he sits in the President’s Office beside a portrait of former President Keith Spalding, who served from 1963 to 1983, including Noll’s four years as a student. “After the announcement about President Altmann, the College got a note from Spalding’s son that said, 'I have to think that Keith, and especially Dot [Spalding's wife, Dorothy], would be mighty pleased.' He oversaw the admission of women to F&M, after all,” Noll said. At 22, could Noll have imagined himself in this position? Following his time at F&M, Noll received an MBA from Vanderbilt University in 1990. He began his career on Wall Street in 1993 as an assistant vice president for strategic planning on the Philadelphia Stock Exchange, then became a managing director of Susquehanna International Group for 15 years. In 2009, Noll came to Nasdaq as an executive vice president before serving as CEO and executive director of Convergex from 2013 to 2017. Beginning in 2008, Noll served as a member of F&M’s Board of Trustees for 10 years before accepting the role of interim president. He has chaired the Finance Committee for the Board since 2015. His oldest daughter, Allie, graduated from the College in 2009. Noll noted that F&M has preserved its values of academic excellence with a focus on people that he knew as a student. It has also changed in 35 years, and for the positive, he said. “Franklin & Marshall has always been characterized by academic rigor, a great faculty, and intimate relationships between faculty and students. That has remained the same. But there has been change, of course, the most important of which has been the implementation of the talent strategy. It’s been eye-opening as a Trustee and alum: how can we as an institution contribute to solving some of this country’s problems?” he asked. “By funding the best and brightest, wherever they’re from, and making sure they get that Franklin & Marshall experience.